I thought I would make a series of blog posts centered around different Chemstation topics. This post’s topic is file structure. A common problem that arises from not knowing the file structure of Chemstation would be the analyst makes some integration or calibration changes, and those changes are saved to the method, but they appear to be lost the next time they run their samples. “Chemstation is not saving my changes!”, one might shout out. Sequences are saved in the Sequences folder. A sequence is just a collection of methods that you can organize to have Chemstation run them one after the other. This file ends with a .S. The Data folder is where you can find all of your data signals, reports, a copy of your method, among other things. This folder ends with a .D. Now that you know the main file types, let’s talk about how Chemstation processes and manipulates these files. In this example, I will be storing my data in Chem32\2\data\test. This information only applies if you have Unique Folder Creation ON. What this will do is create a sequence container to put in your data folder, and it will name it according to your name pattern highlighted above. When I go to run that sequence, as soon as I push the Start Sequence button, the software make a copy of the method you have stored in the Methods folder, and puts that copy in the sequence container. It also copies your sequence file from your sequence folder. From this point on, any changes you make will only be applied to the copy that was placed in the sequence container, in your data folder. And they will NOT be applied to the original method and sequence files located in the Methods and Sequences folder. The original method is referred to as the master method, and the copy placed in your sequence container is referred to as the sequence method. There is also a drop down highlighted above that needs to be selected as well. So now, if I want to change my integration parameters, or my calibration, or even my report settings, when I click on save method, it will only save to the sequence method. When I go to run a new set of samples, chemstation will use the original master method, which hasn’t been affected by any of these changes. In order for any changes to be made to your master method, and subsequent runs in the future, you need to tell chemstation to updated the master method with your changes. This is acheieved by simply going to the Method menu item and selecting update master method. Now any changes that have been made WILL be applied to future runs. Really what I wanted to do here was talk about how the chemstation file structure can dramatically affect workflow. If the user understands sequence vs master method, this can make things much easier! Have any comments, questions, concerns? Please leave a comment below, would love to hear your thoughts! 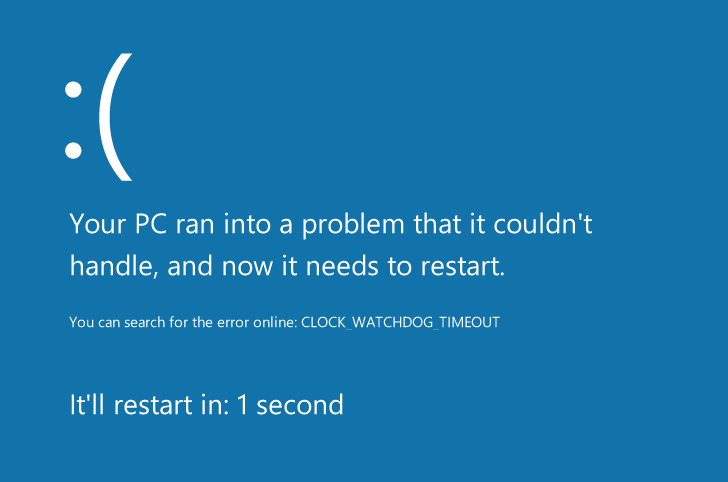 Recently, an older PC that I use kept getting “clock_watchdog_timeout” blue screen of death, and shutting down. I noticed this error would happen shortly after bootup, maybe five minutes. The blue screen of death, with sympathetic sad face. Many fixes online like such as here, and here, mainly pointed me in the direction of drivers and software. In my case, the fix was hardware, and was relatively easy. Side of my pc with the cover off. 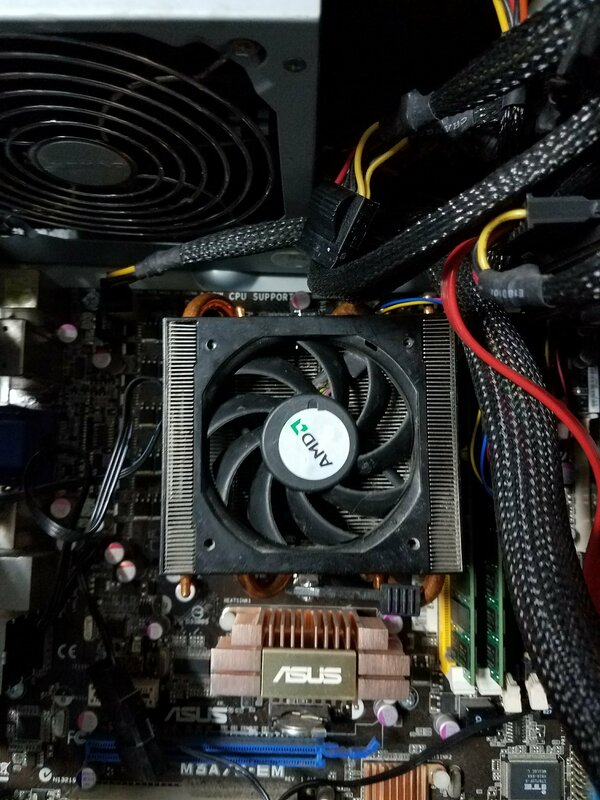 CPU fan is visible towards the middle. I took the side cover off to access the fan. Below the fan blades is where the dust accumulated. In the pucture above you can see the fan. Unfortunately, I didn’t take a picture before cleaning it so that you can see all the dust. To clean it, I’m sure a standard air duster would work, but I didn’t have one handy. I completely removed the fan, there were four screws securing it to the motherboard, and used several q-tips dipped in a little bit of water. This allowed me to gently scoop out as much dust as possible. After that, I put the fan back, and the problem was fixed! I hope this fix may help you with your issue, please leave a question or comment below! Yes, it has been a while since I’ve posted. My intention is to change that. I’m also deviating from a troubleshooting post, to one about my thoughts on CRISPR. CRISPR-CAS9 (or Cpf1) is an exciting new technology that has the scientific community buzzing. In basic terms, with this technology, scientists can modify the DNA in a cell, allowing it to cut out certain sequences, or activate certain sequences. For instance, if there is a “typo” in a cell’s DNA, causing it to propagate a genetic disease, it can be corrected using this technology. The possibilities with this technology seem endless. Mosquitios that carry malaria can be made sterile, which has the potential to save one million people a year from dying. The problem of cancer looks to be closer to an answer, this technology can be used to make better T cells, to effectively fight cancer. The first human trials have already started on lung cancer patients in China. But its not just used for the treatment of disease. It can be used in food to make it grow faster, possibly larger as well. It can also be used to enhance plastic eating bacteria in landfills. There really are a wide array of uses for CRISPR. Does that mean the scientific community should shun this technology due to it’s potential dangers? Absolutely not. But I think something like this should be highly regulated and monitored. If we can cure cancer, and other terrible diseases, then that’s great. But I think we should draw the line at trying to unnaturally enhance humans, both physically and mentally. Also, this technology in the wrong hands could be disastrous, think: Bioterrorism. These are just some of the challenges associated with this revolutionary technology, that I’m sure brighter and more influential minds than myself are thinking about and working through. The future is certainly looking bright, but for the time being I will maintain a cautious optimism. There’s nothing like preparing your samples and starting chemstation, only to see “instrument offline”. There are some basics that can be checked that may be the solution if you are having this problem. You always want to start here. A 68/7890 GC, as well as 1100-1290 LCs use LAN communication for the most part. The main idea being, is the ip address of the instrument and the ip address of the pc compatible? You want the ip address to match up until the last set of numbers. For example: if the gc is 10.1.1.101, the pc needs to be 10.1.1.x. If the LC is 192.168.254.11, the pc needs to be 192.168.254.x. With “x” being any digit from 1 to 255. How can I check the ip address of the GC? This is pretty simple, on the majority of these GCs you can find out by hitting options, then communication on the gc front panel. From here you can see what the address currently is, and you can also change it as well. The LC is not as straight forward, but the default is 192.168.254.11. You can also connect the gameboy to the module and view/edit the ip address. If it’s not the default, and you are not sure what the address is, then you will have to go through a process of changing switches on the LAN card and setting it to default. From there you can keep the default or change to a new address using Telnet. I may write an article on that procedure in the future. From here you can view and change the IP address. Make sure to keep the subnet mask: 255.255.255.0. Hit OK to save the changes. After determining that the addresses are compatible, the next thing you want to do is ping the instrument. To do this you need to launch the command prompt. In Windows 7, click on the Start key for windows, in the search bar type CMD and hit enter. In Windows XP, hit start, and select run, type CMD and hit enter. Once in the command prompt type: ping 10.1.1.101 (or whatever the ip address of the instrument is). You should get 4 replies back, 100% packets sent and received. If not, then check that the cable from the pc to the insturment is connected and good, maybe try swapping it out. If there is a switch or hub in between make sure that port is operational. If there are 2 LAN cards on the pc, its possible that you are connecting to the wrong one, or changed the ip address on the wrong one. 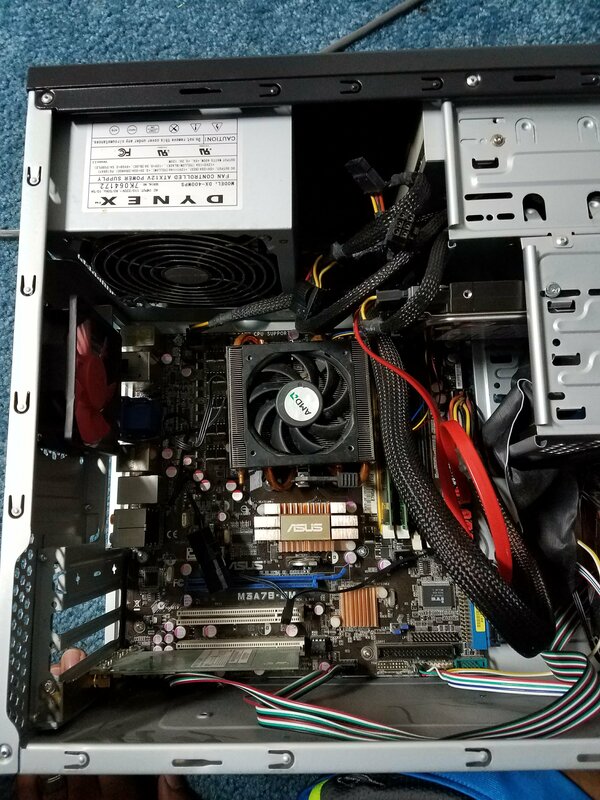 Does the LAN card on both the pc and instrument show flashing LED lights on the port? If not it may be a hardware problem with one of the cards. 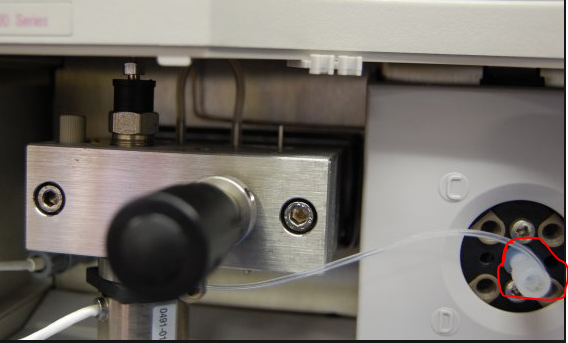 If pinging the instrument was successful, the last piece of the puzzle is ensuring the configuration in chemstation has the proper ip address for the instrument. If you are using a classic version of chemstation (pre-Openlab), go to start, all programs, agilent chemstation, and launch the configuration editor. From here you can view/edit the ip address of what chemstation thinks the instrument is configured to be. In Openlab chemstation, launch the Openlab control panel, select your instrument on the left hand side, and click on configure instrument on the top of the screen. From here you can view/edit the ip address of what Openlab is expecting your instrument to be configured to be. I hope these basic steps of checking/pinging the ip address have been helpful. Please leave a comment if you have any feedback or questions, thanks! 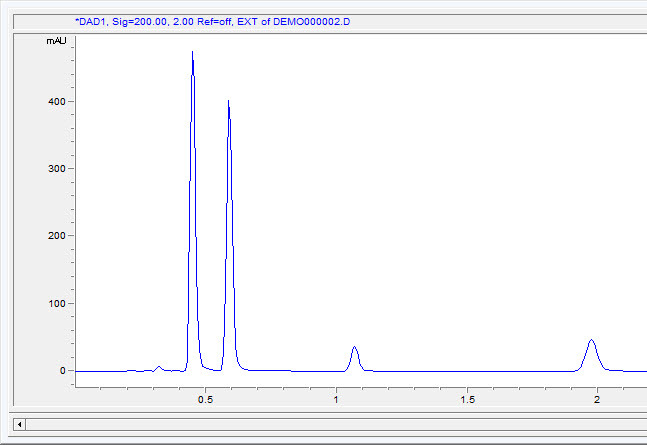 Sometimes you might get strange errors on the HPLC modules. This trick is called the forced cold restart, or factory reset. Basically clears errors and resets set points on the module to the factory settings. This is useful for strange oddball errors that may appear on the HPLC. This works on many of the 1100 up to the 1260 modules. On the back of the module, you will see a row of white dip switches, usually with the label CONFIG. These switches are 1-8 starting from the left. Take note of the exact arrangement of the switches currently, so that you can revert them back to the way they were when you are finished. Turn off the module. Make switches 1,2, and 8 up, and every other switch down. Turn on the module for a few seconds, then turn it off. Return switches to the original configuration. Forced cold restart complete. 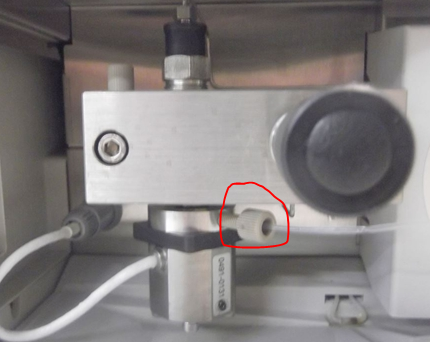 It happens sometimes that the HPLC pump is on and pumping, but there is no flow coming out. If you have an air bubble somewhere in the tubing, you will notice that its either not moving, or just moving back and forth. The very first thing you can try, is just opening the purge valve, and pumping at 5ml/min to get an air bubbles out. Also, you want to check your solvent bottles, make sure there is solvent there. If you are using solvent filters on the ends of your lines, make sure they are not clogged. Sometimes just relieving the pressure here can solve the issue. If not, you will want to remove the outlet ball valve. There is capillary on top of the valve that must be loosened and removed first. Then you can remove the valve. Sometimes the pump can get air locked and just needs to be “burped”. Removing this valve and running the pump will allow it to release any air that may be trapped. You will see a small well where the valve was sitting. You want to make sure that the well fills up with solvent with the pump on. If not, you problem may actually be the Active inlet valve. That valve has a cartridge that can get clogged, or it could be the actual valve itself. Replace the cartridge first, then replace the valve if that doesn’t help. This procedure will work for Agilent 1100\1120\1200\1220\1260 Binary\Quat\Iso pumps. 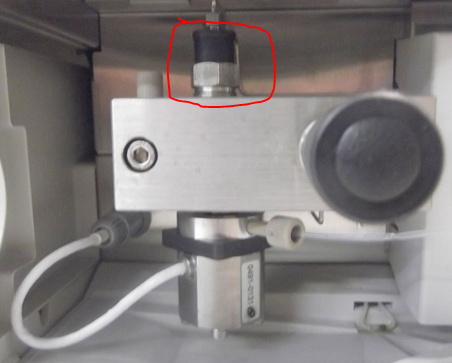 For Quat pumps you also want to make sure that the MCGV isn’t blocking solvent from reaching the active inlet valve. 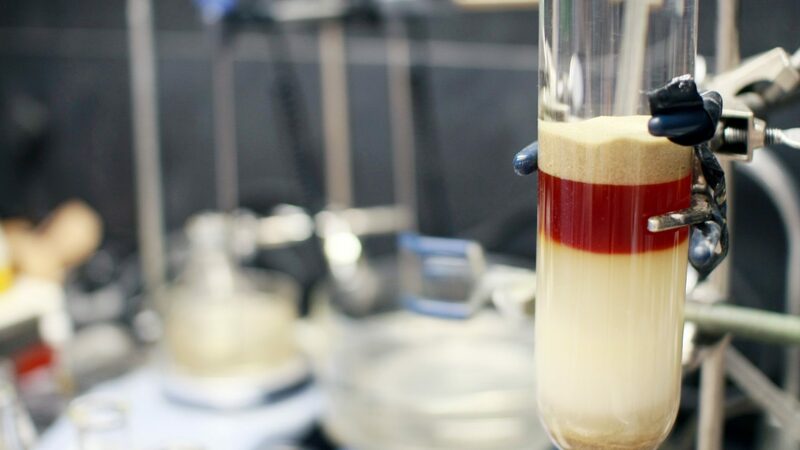 You can remove the line that goes in the middle of that MCGV and just place it inside a beaker of solvent. Turn on the pump and see if there is any change. These procedures assume that the pump is actually moving. You can usually tell just by hearing the pump mechanism moving when you turn the pump on. If you collected spectral data in your run and would like to extract a wavelength from that data, you can follow these steps below. First, load your data file. 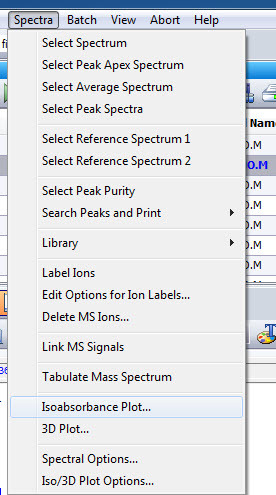 Next, select Spectra then Isoabsorbance plot. On the upper left box on the screen you want to change Cursor to Signal. Then select the wavelength you would like to extract. In this example I chose wavelength 200. You can also specify a reference signal and bandwidth as well if needed. After selecting the desired signal, push copy at the bottom then hit ok. You may get a pop-up message about temporary data, you can hit ok to that as well. 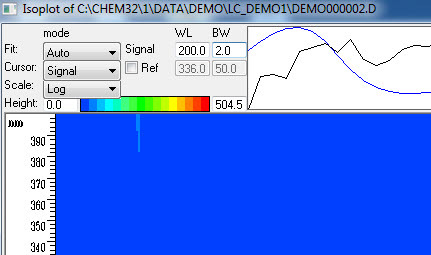 You will now see your chromatogram for the signal you extracted.